From GST to Swachh Bharat, things are not always as they seem. Recently, as I read the newspaper, I was reminded of a funny story that one of my teachers told me in school. An English teacher, he said that as a student he had realized that no teacher ever read full English compositions in the composition assessments they were grading, except maybe the first two and last two paragraphs. To test this theory, he used to insert a completely random sentence in the middle of the narrative in his compositions in school. For example, as he put it, in a composition about "The Autobiography of a Pen", where the narrative was sedately progressing in the middle, he apparently inserted the line "The Wrath of Khan is a pretentious movie with an overhyped trope of vengeance." Naturally, when this inspired no reaction, he tried the same trick over different semesters with the same result. And so, he warned us not to pull such tricks in our assessments, as he would be on the lookout. When it comes to the dispersal of funds, it seems that the Centre has an admirable record of trickery. The reason I remembered this story was the headlining antics of our Finance Minister over the course of this month in Parliament. As we all know, parliamentary reporting in India is literally non-existent. It is assumed the procedures are too complex, the bills being presented are boring and unlikely to result in any significant upticks for the reporting correspondent. Mr. Finance Minister seems to understand this and at the first instance has introduced sweeping amendments in the Finance Bill presented in Parliament (which were not there in his 1 February budget speech) in the hope that nobody would notice the travesty. These included the arbitrary inclusion of an Aadhaar card for availing /filing essential and non-essential benefits and other such far reaching amendments with difficult implications. 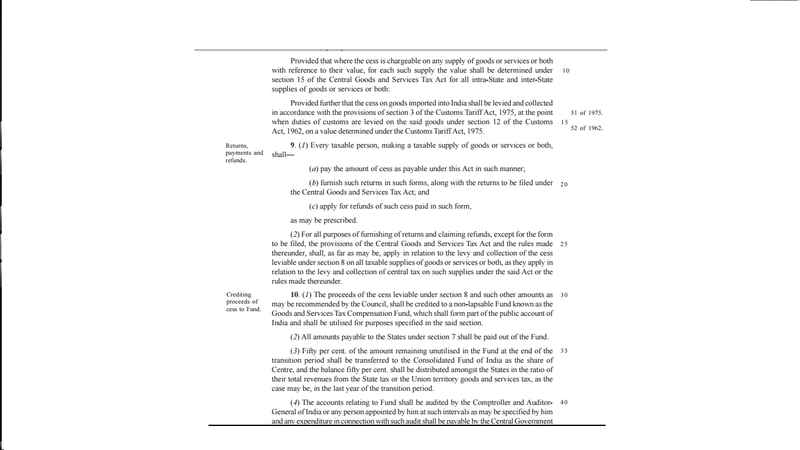 When this passed through with minimum fuss, the four GST bills were introduced in Parliament in a blitz, on Monday, without initially including them in the business of the day. (They were subsequently forced into a supplementary list to cloak such machinations). Parliamentarians went into a tizzy because they had neither been given time to prepare for a debate nor did they know the intricacies of the sweeping tax legislations. Mr. Finance Minister meanwhile went about the day's business, slightly abashed that his antics were discussed in full view of the country and all subterfuge had evaporated. Speaking of the GST makes me talk about the other antics Finance Ministers have indulged in, in the name of taxes. The present GST Bills presented in Parliament have a "GST Compensation to States Bill", which essentially hopes to compensate states because their power to tax resident tax payers have been snatched away, resulting in significant revenue loss. This will be done through a cess which the taxpayer will pay because the Centre in all its magnificence is taking away the state's power to tax its own people and fund its own growth. The collections will go into a "fund", in front of which the states will stand with a begging bowl for money that has been generated within their boundaries. The Central government will give the state governments money every two months from this fund, and the clincher—after five years it will appropriate 50% of any amount left in the fund for its own discretionary use. The taxpayer pays for the revenue lost by the state government because the Central government wants better control of taxation. Let us wrap our heads around this. The taxpayer pays for the revenue lost by the state government because the Central government wants better control of taxation. The states plead for their own money from the fund and hope it is dispersed on time and the Central government, like a loan shark, can dilly-dally, and at the end of five years appropriate 50% of the state money somehow funded by the taxpayer for state revenue, to cover its own needs. Bravo indeed; and the states have been literally coerced to accept these propositions in the GST under a cosh by the Central government because the FM went on record and made statements like"investors would be careful of choosing states if they are seen to be on the wrong side of reform, etc etc..." when the Bills were being formulated. When it comes to the dispersal of funds, it seems that the Centre has an admirable record of trickery. For example, in the case of the Swatch Bharat Cess, they miserably failed to meet their targets and then released a clarification that the cess collected "may or may not be used" for the stated purpose. This is possible because the cess goes into the Consolidated Fund of India (CFI), and then government introduces a notification in Parliament and publishes it in a gazette stating the purpose for which funds in the CFI may be used. Now the CFI is a consolidated fund like your wallet, where all types of currencies go in without demarcation and money is apportioned, when needed, without label. And hey, who reads the hundreds of notifications which are introduced in every session of Parliament and are passed through with sleepy voice votes? So the money inserted through cess can literally come out to hypothetically fund the 'Revival of The Legendary Sarayu' project or some such brilliant scheme which the government may dream up for you: the citizen. Presto, they have just pulled a "line in the middle of the composition trick" and appropriated money which was not even meant for them or has no context with the original cause. Going by above track record of the Central government and the shocking disappearance of funds that... we must start tracking what happens in Parliament very actively and carefully. The greatest example of this trick is the "Secondary Higher Education Cess (SHEC)" which was introduced in the financial year 2008. The CAG has recently released a report which says that ₹64,000 crore collected as SHEC has no trace as, "Neither was a fund designated to deposit the proceeds of the cess nor were schemes identified on which the cess proceeds were to be spent." Consequently, the commitment of furthering secondary and higher education as envisaged in the Finance Act "was not transparently ascertainable from the Union account." This basically means that no one knows if funds collected were actually put in a Fund, utilised towards the reason for the levy, or even utilised at all. In other words, there is literally no trace of the money being collected as SHEC or what it is being used for till today. Another severely underutilised fund is the Research and Development Cess which aggregated to ₹6,698.30 crore, collected during 1996-97 to 2015-16. "Out of this only ₹579.16 crore (8.65%) was utilised towards the objectives of levying the said cess," and the rest of the money has disappeared into a black hole. R&D Cess was abolished this year in the Finance Bill, much to the relief of the industry as a whole. What happens to the under-utilised funds? Nobody knows or cares. Going by the above track record of the Central government and the shocking disappearance of funds that have been happening over the years, there's an urgency for us to start tracking what happens in Parliament very actively and carefully. The government is happy to ignore legislative reporting because it actively uses legislation to fund its needs as and when required on the assumption that nobody cares to read or follow Parliamentary procedure. This process needs to be checked before successive governments start running amok by taking their citizens for granted and diverting their money for their pet causes.